Periodontal disease is a chronic bacterial infection of the gums and underlying jaw bone, and is the number one cause of tooth loss in America. Consistent treatment can control the progression of periodontal disease, allowing patients to save teeth. Periodontal disease begins with simple dental plaque that hasn’t been effectively cleaned from teeth. Plaque is the yellow substance that sticks to your teeth and, if not brushed and flossed away, results in tooth decay. Gums that are swollen and bleeding indicate that they’re infected with the bacteria found in plaque. Swollen and bleeding gums are an early sign of periodontal disease. Eventually, plaque will spread below the gumline, where it’s difficult to remove. When your gums swell, a space is formed between the gums and teeth, encouraging more bacteria to grow. If left untreated, periodontal disease can cause teeth to become loose and eventually destroy the supporting structures of the teeth. The progression of periodontal disease begins with swelling and bleeding at the gumline, known as gum disease or gingivitis. This first step in the progression of periodontal disease is generally reversible with professional teeth cleanings and consistent dental care at home. If left untreated, gingivitis can lead to a condition called periodontitis. The plaque that gathers along the gumline hardens into a substance called tartar or calculus. This accumulation causes gums to pull away from the teeth, forming “pockets” where food particles and bacteria gather. The supporting gum tissue and bone become infected and are eventually destroyed, leading to pain, discomfort and tooth loss. In addition, bad breath may develop or pus may be present. 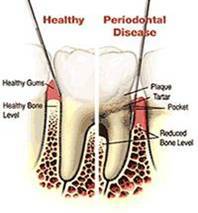 The most common cause of periodontal disease is inadequate dental care. An at-home regimen of thorough brushing and flossing is required for both the prevention and treatment of periodontal disease, as well as regular professional cleanings. Even those who take meticulous care of their teeth can experience periodontal disease. Certain people are more susceptible to this condition, including diabetics, tobacco users, and those who clench or grind their teeth. Regardless of the cause, it’s imperative to seek treatment as soon as possible to prevent the progression of periodontal disease. The central goal of treating periodontal disease is to remove all disease-causing bacteria and regenerate the supporting structures of your teeth. The extent of the periodontal treatment prescribed will depend on the progression of periodontal disease present. Dr. Goldwyn and his compassionate staff at Portland Periodontics provide a variety of treatment options for those dealing with periodontal disease. Scaling and root planing is a non-surgical treatment that removes large deposits of plaque and calculus from teeth. This procedure reduces the signs of infection and reduces swelling, bleeding, and pocket depth along the gum line. Surgical pocket therapy is used when scaling and root planing is not sufficient to clean the affected areas. This procedure allows Dr. Goldwyn to visually remove the accumulation of bacteria from the pockets that have formed around teeth. Regenerative Procedures – Regenerating lost gum tissue and jaw bone can reverse the destructive process of periodontal disease. Bone grafts, membranes and biologic materials can be applied to regenerate bone. Resective pocket Reduction Procedures – Periodontal pockets result from the accumulation of bacteria that form pockets around teeth along the gumline. Infection spreads to supporting bone, leading to tooth loss. Dr. Goldwyn can measure the depth of the pockets, surgically remove the bacteria, and secure the gums to eliminate the periodontal pockets. A daily oral hygiene program that includes brushing and flossing is required to prevent recurrences of periodontal disease. Regular check-ups with Dr. Goldwyn at Portland Periodontics is often recommended to maintain a healthy mouth. Periodontist in Portland Dr. Goldwyn and his professional team of dental implant and periodontal care experts at Portland Periodontics are dedicated to the treatment and care of periodontal disease as well as teaching every patient effective techniques that will help ensure the control of periodontal disease.